While the future of immigration reform is uncertain, we can be certain that immigrants contribute to the state’s workforce, economy, tax revenues and communities. Oftentimes the topic of immigration reform stirs up heavy debates and preconceived notions about what it means to be an immigrant in the United States. Reality about immigrants, their occupations and contributions to the economy can be misunderstood. 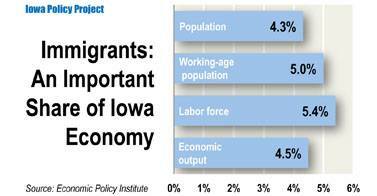 But here in Iowa, we know immigrants are important to our state and our economy. There are 120,000 documented and undocumented immigrants contributing both as workers and as employers. Most immigrants came to find jobs so it shouldn’t be surprising that most are of prime working age, and are working. Look around your community and you will see them working in grocery stores and delis as butchers and meat cutters, teaching in high schools and colleges, cleaning homes and businesses, and working as computer programmers. Some are small business owners, filling gaps for particular goods and services in Main Street-type businesses. One big misunderstanding is about the state and local taxes that immigrants pay, regardless of their legal status, on the income they earn, the goods they purchase and the homes where their families live. It is also estimated that 50-70 percent of undocumented workers — those who do not have legal authorization to work or live in the United States, have federal and state income and payroll taxes withheld from their paychecks. Our new Iowa Policy Project report estimates that undocumented immigrants annually pay $64 million in Iowa state and local taxes, increasing revenue available for public programs and services, including many services they are unable to access themselves. Immigration reform enabling work authorization and a path to citizenship for current undocumented residents would bring benefits not only to immigrants but all Iowans. Legal work status would open up better job opportunities and make it more worthwhile to invest in worker education and training. Immigrants would be less susceptible to wage theft and other exploitation by employers. Legal status would increase earnings for workers and revenues for the state. It would mean that young adults brought here as children (DREAMers) could attend college and get better jobs and it would give immigrant business owners access to more options to start or expand a business. Previous Previous post: What are U.S. workers missing?